"Ajay Devgn , Prakash Raj, Rohit Shetty, Aave Singham, Kajal Aggarwal, Majja Satkeli, Gotya…" These are some phrases that keep rolling onto your mind as soon as you leave the theatre. While you are inside the theatre, movie never gives you a chance to halt for a second; it’s a helluva fun ride. Say it a Masala Movie, Family Entertainer, Paisa Vasool Movie or South Indian remake, I absolutely love this movie. I saw the portrayal of Pure India, Young India and Beautiful India in this movie unlike some movies which tend to show harsh realities and stuff. Ajay Devgn ( People say Salman is a Mass Actor, But I have never seen people in PVR Cinema cheering and clapping so much in any Salman Khan movie like they did for Singham ). He is undoubtedly a Hero. 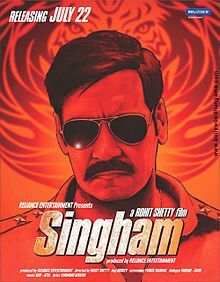 And Singham is all about his heroic portrayal done brilliantly by Rohit Shetty. Prakash Raj is one of the best (apart from remakes) that we have imported from Tollywood. He is a perfect goon, the tag which I would give to Amrish Puri or Amjad Khan or Prem Chopra. Direction by Rohit Shetty is awesome! Cinematography by Dudely is breezy and spirited (thanks to brilliantly shot action sequences.Who cares even if it is larger than life!) Screenplay by Yunus Sajawal is zippy. If these aspects would not have been better, than movie would have been high on style and low on content; which I am glad is not the case with Singham. Bunch of Marathi Actors and Kajal Aggarwal are takeaways too. The later looks as sweet as candy floss. Background Score (mostly made up from its title track) is up roaring and plays a major role behind Singham’s coolness. The movie is made to make you feel good. And does it? Hell yeah!! Ajay Devgn as Singham, looks and acts like a Singham. I wonder what would have been if Surya was selected as Singham. Kajal Aggarwal is absolutely adorable. Marathi actors like Govind Namdeo, Sachin Khedekar, Sonali Kulkarni (she was a bit loud) are the backbone of the movie. There is nothing new in the story, but is it needed? No. Even an ordinary story with brilliant performance and Direction can be hot shooted. And this is what Singham does. Screenplay is dynamic, the story never loses its energy. Editing is tight in first half. The film looses grip in second half where a song is added, which wasn't needed at all.Real India is really well shot! Goa seems to be favorite of Bollywood these times. Action Sequences are soul of the movie. Music by Ajay - Atul is very good. All the three originals are well shot in the movie, but Maula was not needed to be included. Background score by Amar Mohile as I wrote earlier, is up roaring. Rohit Shetty's best till date. A sure shot hit of the year! !